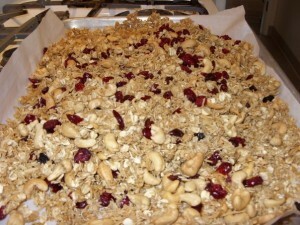 Preheat oven to 250 degrees F. In a large bowl, combine the oats, cashews, coconut, brown sugar and salt. Whisk to combine the blood orange olive oil and maple syrup. Pour over evenly over the oat mixture and . toss to thoroughly distribute. Spread the mixture on to two rimmed baking sheets and bake, stirring every 20 minutes to ensure even browning. 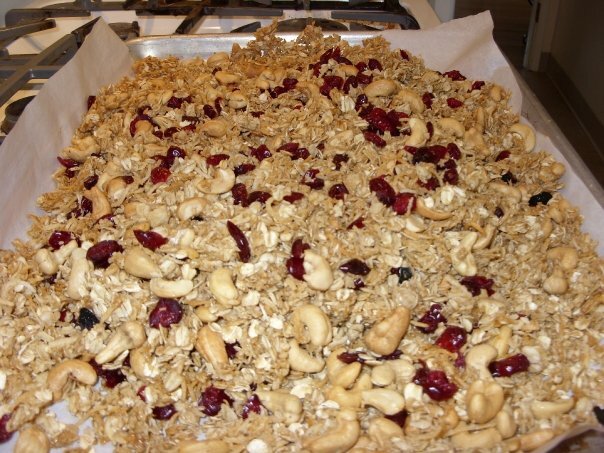 Granola will be done when it’s golden brown and well toasted. Remove from oven and transfer into a large bowl. Add cranberries and mix until evenly distributed.